You are currently browsing the daily archive for 30 March 2005. This will come as no surprise to anyone who knows me well, but I love public transportation. Americans are supposed to associate automobiles with freedom, but I love the idea that you can get around the city, or indeed around the world, without having to worry about parking, repairs, insurance, gas, and accidents, and with only the pack on your back. And of course there are the environmental arguments, yada yada yada. I love trains best of all, and the best of all trains are the ones that go underground and get you all over the city efficiently. I love the fact I have to ride the metro every day here. In Washington, it was a hell of a lot faster for me to bike to work than ride the metro, but I always secretly wanted to be a metro person. Each metro/underground/subway system has its drawbacks, and St. Petersburg’s is that every rush hour reminds me of the New Year’s Eve I spent in Times Square worrying I’d be crushed to death, but I’ve even gotten accustomed to that. I love people-watching, and I appreciate the opportunity to try to improve my Russian vocabulary by reading inane advertisements and the free newspaper they hand out. I like to time the distance between stops and between trains, and calculate where I need to wait on the platform to have the speediest transfer or the shortest distance to the exit at my destination. I automatically factor in the 3.5 minutes it takes on each end to ride the escalators so that I can be punctual, though I’m also one of the people who sprints down the escalator when I’m running late. It isn’t possible to sprint UP the escalator unless you’re one of the first ones on it, because there’s such a high volume of ridership that there’s not really room to stand-right-walk-left, and furthermore, these are the longest escalators you’ve ever seen, so to walk up you have to be prepared for some serious physical exertion. I think I’ve managed it three times. So for a metro geek like me, what could be better than a new metro stop opening this weekend? The fact that it’s right next to a certain somebody’s house. The new metro station at Komendantsky Prospect, 29 March 2005, 8:58 p.m. So one of the best things about the Russian language is that you can make pretty much anything little and cute with the addition of a suffix or two or three. The more suffixes, the better. So there’s this word in use at the kindergarten, which no one else I know seems to be familiar with: pomogalochka. It’s from the verb pomogat’ — “to help”, and I suppose literally it should mean “little helper”, but in our classroom it’s used to mean “a small piece of bread which you use to shove food on your fork or spoon rather than using your fingers.” All the kids know this word, and have taken to asking for their pomogalochki at lunch. It’s pretty funny. So yesterday I was hanging out in a cafe, and I looked across the room and saw a very manly-looking person with earrings, a cowl-neck sweater, and long painted fingernails, cuddled up next to a man, having what looked to be a pretty serious conversation. I do believe I saw my first Russian transvestite. It was heartwarming, because the atmosphere is pretty homophobic here. I mean, surely a certain amount of gender-bending goes on behind closed doors, but in public? Never. The cafe in question is close to the main university campus, and therefore more likely to be populated with enlightened folks I suppose, but nonetheless, I was pleasantly shocked. I'm an American who started blogging when I moved to Russia in 2004. Eventually I moved to Sweden, where life is pleasant but uneventful, and stopped blogging for lack of interesting things to say. And then I joined Facebook, which further destroyed any motivation for blogging. 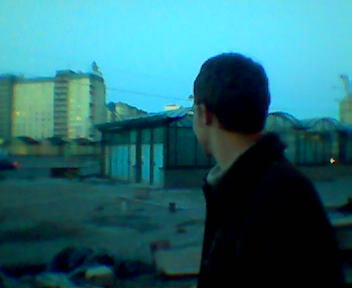 Maybe someday I'll start blogging again, but for now, this blog is dormant, an archive of The Russia Years: 2004-2008.